I saw this fab idea here at Artful Adventures and just had to try it. I should start by saying that if you're not using watercolours like I didn't you might need to experiment with the ratio of paint to water, and I would advise using some heavy good quality paper. As usual Jake and I got too excited about starting it and it didn't work as well as it could have done, however Jake LOVED spraying the paints and didn't remotely care about the outcome!!! and Jake got spraying straight away! ...and of course Jake just had to spray the whole garden too!! I was wondering how you did this without actual spray paint. :-) I love how this is a full circle activity and he was involved every step of the way. Pinning this in my Fall folder. I see your leaves haven't really changed colour yet, either. This looks like a fantastic activity for my buddies! Thanks for the inspiration! I am just like you... always to excited to wait and figure things out. I love the way it looks on the towel, but the experience must have been wonderful. 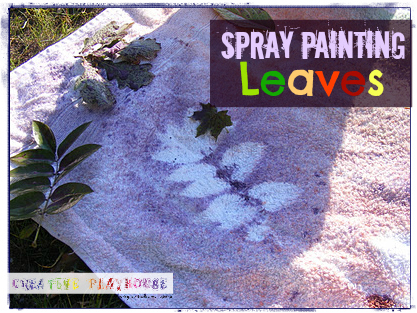 My kids are in love with spray bottles so this is the perfect activity for us! What a great idea! We are All Year Round Blog Carnival co-hosts and we've featured you here http://littlehomeschoolblessings.blogspot.com/2012/10/all-year-round-carnival-september-round.html?m=1 .